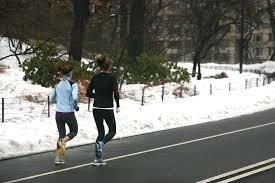 We know it’s gotten cold and that exercising outside probably isn’t at the top of your list. With that in mind, we have a few tips, tricks, and information to make it easier for you to move more during the winter months. Comment below with any more tips and tricks that have worked for you! 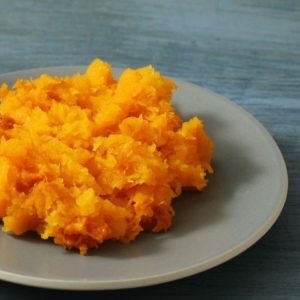 Butternut Squash is a healthy and tasty dish to add to any meal. It is easy to cook and requires very little added ingredients. Cut squash in half and seed. Place the halves on a baking sheet, cut-side down. Bake until tender when pierced with a knife, 45 minutes to 1 hour. Scoop out flesh when cool enough to handle. 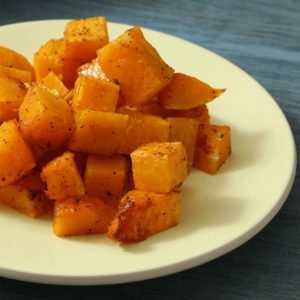 Toss squash with oil, salt and pepper. Spread on a large rimmed baking sheet and roast until tender and lightly browned, 30 to 45 minutes. 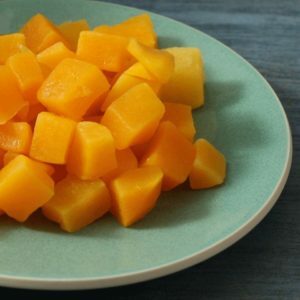 Add squash; cook, stirring frequently, until tender and lightly browned, about 15 minutes. Bring 1 inch of water to boil in a large saucepan fitted with a steamer basket. Add squash. Cover and steam until very tender, about 15 minutes. 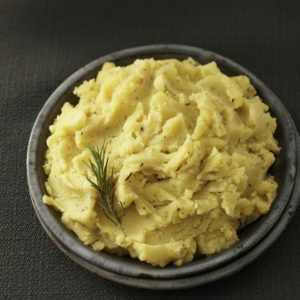 In this healthy mashed potato recipe, we use “no-chicken” broth instead of milk, cream or butter to make full-flavored, vegan mashed potatoes. Regular reduced-sodium chicken broth can be used as a substitute. Peel potatoes, if desired, and cut into 2-inch chunks. Place the potatoes and salt in a large heavy saucepan. Add cold water to cover by 2 inches. Bring to a boil. Reduce heat to a simmer, cover, and cook until potatoes are very tender, 10 to 15 minutes. Drain well. Stir broth, oil, rosemary and pepper into the potatoes. Use a spiralizer to skip the peeling and slicing in this easy apple crisp recipe. Plus the noodley texture of this gluten-free fruit dessert is a fun adaptation of traditional versions. 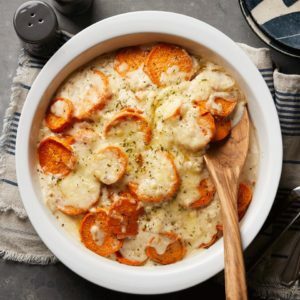 If you’re looking for a twist on classic scalloped potatoes, this recipe using roasted sweet potatoes and melty Gruyère has all the creaminess of the original with a new flavor twist. 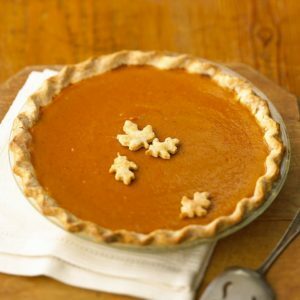 The sweet potatoes and lightened sauce—made with flour and low-fat milk—keep it healthier than butter- and cream-laden versions. Don’t cut your sweet potatoes too thin—they’ll turn mushy under the sauce. 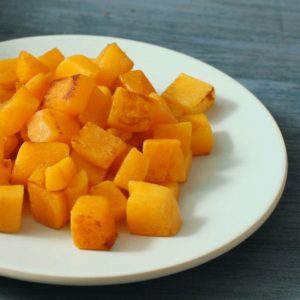 Toss sweet potatoes with 1 tablespoon oil in a large bowl until well coated. Divide between 2 large baking sheets and spread in an even layer. Roast, rotating the pans from top to bottom about halfway through, until tender and beginning to brown, 20 to 25 minutes. Meanwhile, heat the remaining 2 tablespoons oil in a large saucepan over medium heat. Add onion; cook, stirring frequently, until very soft and golden brown, 5 to 8 minutes. Add flour, salt and pepper; cook, stirring, for 1 minute more. Add milk; cook, stirring and scraping up any brown bits at the bottom of the pan. increase heat to medium high; cook, stirring, until the sauce thickens and bubbles, 3 to 5 minutes. Remove from heat. When the sweet potatoes are done, remove them from the oven. Preheat the broiler. Transfer half the sweet potatoes to a 2-quart broiler-safe baking dish. Spread half the sauce over the sweet potatoes and top with ½ cup cheese. Add the remaining sweet potatoes and top with the remaining sauce and cheese. Broil, watching carefully, until the sauce is bubbling and the cheese is beginning to brown, 1 to 5 minutes, depending on your broiler. Let stand 10 minutes. Serve topped with rosemary. Chicken thighs can take plenty of cooking without getting tough or drying out, which makes them perfect for the slow cooker. Here we braise them in Guinness stout along with hearty vegetables, with just the right amount of bacon for added savoriness. Combine 6 tablespoons flour with ½ teaspoon each salt and pepper in a shallow bowl. Dredge chicken thighs in the mixture to coat completely; transfer to a plate. Heat 2 teaspoons oil in a large skillet over medium-high heat. Add half the chicken and cook until well browned, 2 to 4 minutes per side; transfer to a 5- to 6-quart slow cooker. Reduce heat to medium and repeat with the remaining 2 teaspoons oil and chicken thighs. 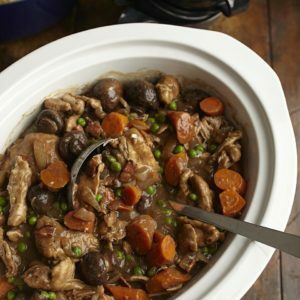 Arrange the chicken in an even layer in the slow cooker. Add bacon to the pan and cook, stirring often, for 2 minutes. Sprinkle the remaining ½ cup flour over the bacon and cook, stirring constantly, for 2 minutes more. Add stout and use a wooden spoon to scrape up any browned bits from the bottom of the pan. Pour the mixture over the chicken. Add carrots, mushrooms, onion, garlic and thyme, spreading in an even layer over the chicken. Pour broth over the top. Stir in peas, cover and cook until the peas are heated through, 5 to 10 minutes more. Season with the remaining ½ teaspoon salt and pepper.